Quito is the capital city as well as the as the second most populous in Ecuador. The city has the largest and best-preserved heritage centers in America. Considering the city's rich heritage, Lookupfare has come up with many cheap flights to Quito, which in turn helps travelers to get their traveling costs sorted in lowest of budget. And, this won't only cut down your travel costs but also add a lot more to it. 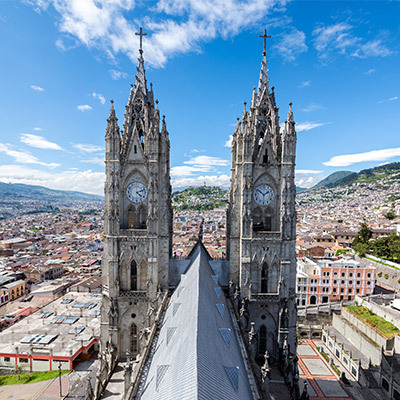 The city of Quito is known for its numerous attractions that include many museums, cathedrals, to-notch libraries, parks, mix traditions & cultures, historical centers, modern buildings, sub-tropical climate, rich history, different cuisines, and major industries. Not only this, but the capital serves as the economic backbone of the country of Ecuador. The city's Oldtown - UNESCO World Heritage Site comprises of different monuments and architecturally endorsed sites. The city has abundant supplies for the tourists because of which the number of low-cost flights to Quito has increased, and Lookupfare has them all sorted for you. Iglesia de La Compania de Jesus: A beautiful church known for its baroque work is Iglesia de La Compania de Jesus. Did you know what sets this church apart from others? The construction of this Jesuit church began in 1605 but took more than 160 years to get completed. The chief masterpiece alone took 20 years. Also, the former President Gabriel Garcia Moreno is buried here too. The church's unique features which include the perfect symmetry and symbolic elements are also highlighted by the free guided tours in English or Spanish. Museo Guayasamin: This excellent museum houses the most significant collection of Oswaldo Guayasamin, a legendary painter. Also, many outstanding collections of pre-Columbian ceramic, bone and metal pieces, religious art, and collection of crucifixes are displayed here. TeleferiQo: Quito's mountainous landscape are known for the spectacular views of the city. TeleferiQo place comprises of a Vulqano Park, which is an amusement park located at the base station. Please note that you visit this enthralling site early morning for some of the spectacular views. El Panecillo in Quito: A huge statue of La Virgen de Quito which almost took 20 years to be completed, is a site which is always bustling with tourists. El Panecillo is truly an excellent viewpoint and major Quito landmark. Parque La Carolina: More famous with the local families, this famous park is always bustling with families on weekends out for work out, games, and paddleboats. This place covers Paramo - high-altitude Andean grasslands, cloud forest, wetlands and other areas such as Vivarium, where you can get an up close view of many reptiles and amphibians. Parque El Ejido: Located in the Northeast of La Alameda, El Ejido is a favorite spot for sports like soccer and volleyball. Open-air art shows are held on weekends which is also been a huge success amongst visitors. And, at the north end of the park, many artisans and crafts vendors set up stalls and turn the sidewalks into a full blooming handicraft market. La Cima de la Libertad: This historical monument offers one of the finest views of the whole city. It was built at the site of the Battle of Pichincha which was supposed a significant place in the struggle for independence from Spain. Quito has a subtropical highland climate with an average temperature at noon of 18.7 degree Celsius and regular night time of 9 degree Celsius. The city has only two seasons i.e. dry and wet. The best times to be visiting the city is between June and September that enjoys summers and between October and May that is, referred as winter. Since Quito is near to the equator, the city receives relatively constant cool climate. Mariscal Sucre International Airport is the primary and the nearest airport to Quito. It is just 11 kms far from the center of Quito, Ecuador. The airport holds both international and domestic flights which connects it to the rest of the world. No processing fees and no extra costs! Yes, you heard us right. We, at Lookupfare, will help you get the low cost airline tickets to Quito. Not only this, but we are here to serve your last-minute plans as well. One can also grab last minute flight tickets at reasonable prices.